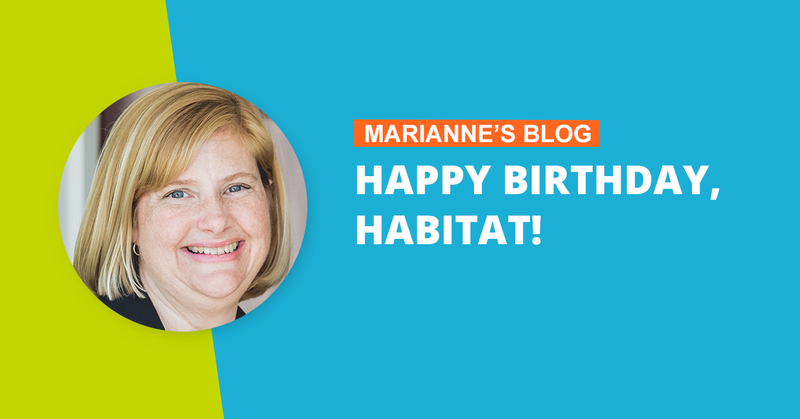 Marianne’s Blog- Happy Birthday, Habitat! 2019 marks the 30th anniversary of Habitat for Humanity of Montgomery and Delaware Counties. Many of you have shared stories about the early days…meeting in a church basement, working on homes with no structural walls, being an all-volunteer organization. Thirty years have brought tremendous changes. We started as Habitat of Norristown, then expanded to Pottstown, Upper Dublin and Hatfield, and began offering critical home repairs throughout Montgomery County. We’ve added services like financial empowerment education and neighborhood revitalization. Our Delaware County counterparts were on a similar journey, and in 2017, we combined forces as Habitat for Humanity of Montgomery and Delaware Counties. The early days were challenging, to say the least – no staff, fundraising fits and starts, wanting to do more, but not having the capacity. The early days were also some of the best – the lifetime friendships that developed, the families that were stabilized, the beautiful way that faith guided so much, especially when resources were in short supply. Some of the best stories are of families who raised kids in their Habitat homes, saw them off to college and are proudly seeing them in their own homes. Now that we are 30, we are seeing some homeowners pay off their mortgages and have the privilege of celebrating this landmark with our many families. I’ve been around for about 10 of our 30 years and there are a few things that stand out to me as we become a middle-aged non-profit. First, I hope we never lose the idea that volunteers propel this work. Without volunteers, there would have been no Habitat, or homes, or families whose lives have changed forever. Without volunteers stepping up, there would have been no structure, or governance, or in troubled times, someone to step in to help this organization survive and eventually thrive. Even though Habitat’s volunteer needs have expanded, there is still no shortage of opportunity to make a difference. Second, there is still great need for our services, perhaps even more so than when we first formed. Affordable homeownership is getting farther away—not more attainable—due to stagnant wages for low-income households and the rising cost of everything, including rent, food, medical care, transportation and so much more. So, even though we are 30, we have a long way to go. Third, and probably one of the more important things is the struggle for financial stability. In looking through old strategic plans, I saw that this was an organizational priority in 1999, 2009 and still is in 2019. We have made great strides through the ReStores and a growing investment in fundraising. Yet, it is incredibly difficult to be a financially-stable organization and meet the growing need for services. We raise more money, but there are more people who need homes, and repairs, and financial education to own homes and stable neighborhoods to protect our homeowners’ investments. To improve and increase impact, we must be willing to invest. For Habitat, that means continued support of construction, mortgage education, staff training and retention, technology and much more. It is now 2019 and we are 30, but we aren’t resting on our laurels. We have 25 homes to build in the next few years, hundreds of repairs to do, neighborhoods to revitalize, thousands of volunteers to engage and most importantly, thousands of community members in need of Habitat so they can own a home, have a roof that doesn’t leak, know how to manage their money, and live in a safe neighborhood.